It is a requirement of your Agreement, that the goods are protected against Theft and Accidental Damage. We can arrange Theft & Accidental Damage Cover for £1.06 per week. It is a requirement that products purchased on a credit agreement are insured. We can offer Theft and Accidental Damage Cover for £1.06 per week. 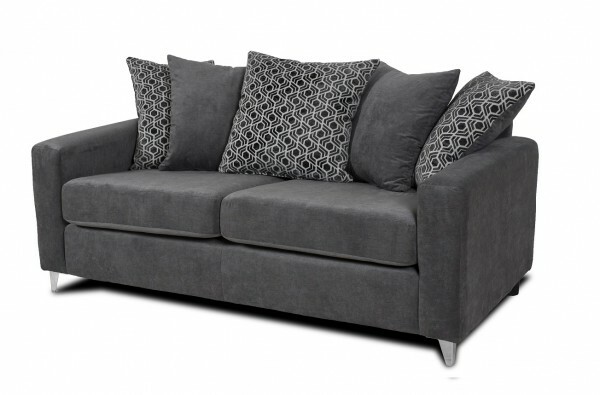 This 3-Seater Alexis sofa comes in a dark grey fabric grey which is sure to compliment any modern room. With a scatter back design, cosy up with this stylish sofa. Complete the look with the 2-seater, chaise and corner sofa available. Pay weekly, live stylishly.